Dare to look into the eyes of the snake-haired queen Medusa, for if you do all your stakes and free spins will be turned to stone. Explore this ominous scratch game and the wonders of ancient Greece’ mythical past. Uncover three cards alike and you may be onto a winning jackpot of 1000x your original stake. 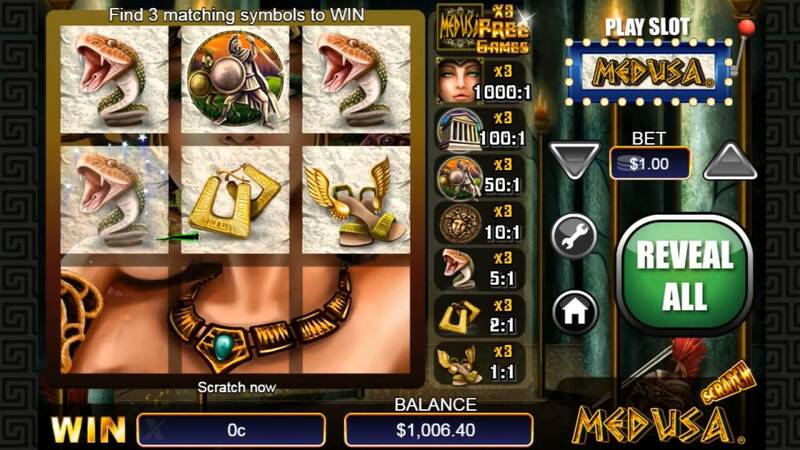 However, you must be cautious to avoid a stony ending in this dark online slot. NextGen delivers on their promise to create amazing gaming content that delivers high-quality gaming solutions, continuously. Through their diverse range of artistry, technical expertise and personality they bring online slot gaming to life, constantly willing to push the boundaries and develop a range of much-adorned games that include Golden Mane, Prosperity Twin, and more. The legendary snake-headed villain Medusa awaits your presence, but are you brave enough to face her? Match the symbols and be in for a chance to reap the rewards of this scratch card game and live to fight another day before you’re turned into stone. Scratch Medusa offers you an exciting adventure in Ancient Greece and you will be sure to reap the rewards of your heroic efforts along the way. In Greek mythological legend, the Goddess Medusa was described as an evil villain who instead of hair had real live venomous snakes sliming all around her head with the story surrounding her that any man who gazed into her jealous eyes would be immediately turned into stone. Don't stare at Medusa too long! If you dare to try and gaze long enough into her eyes on Scratch Medusa you are in for a chance to win stacks of prize wins instead! Sneaking her way up on this virtual scratch card game, she will show all her power on the screen! In this card game players can expect high-end quality graphics and some massive payouts. The Scratch Medusa Card game is quick and simple to play, making it a great entry point for new gamers looking to cut their teeth in the online slot market. To get started playing this exciting scratch card game, all players need to do is click on the bold ‘Play’ button and bet from as little as 1 pence all the way up to £2. Only after you’ve submitted your bets, you’ll be able to up the ante of the game by revealing one shiny scratch card panel one by one. However, if you’re a little too impatient and want to see how much you’ve won immediately, simply hit the ‘Reveal All’ button to see what symbols are hidden behind the panels all at once. To achieve some of those big prizes, all players need to do is reveal 3 matching symbols. It really is that simple, just like a regular scratch card! Some of the symbols you’ll find behind the scratch card panels are snakes, ancient Greek buildings, and medals, which all add up to the overall Grecian Goddess look and feel of this game. Play Scratch Medusa and let the evil Medusa work her power around the board and scratch away the symbols to uncover an exciting range of hidden treasures fir for the king. Be sure to scratch and win otherwise you eye the threat of being turned to stone and living for eternity in Medusa’s serpentine dungeon.